Correspondence with (mostly) Labor Party colleagues. Includes telegram from Ken Fry (May 1977) reporting CIET Darwin's success in establishing radio contact with Fretilin; also McIntosh's note (Nov. 1978) to colleagues on use of the term Comrade. 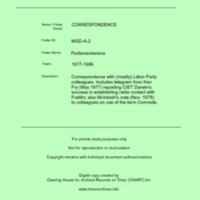 “Parliamentarians [MGD A2],” CHART DIGITAL, accessed April 18, 2019, http://chart-digital.info/items/show/612.